Imagine your backyard transformed into your favorite resort getaway. Think of the time well spent with family and friends, the food, libations, and fun. It's no surprise that Alfresco can make your imagination a reality - after all, we've built equipment for many of the nation's finest hotels and restaurants. Through constant innovation, we strive to bring the professional culinary experience to the outdoors. For many, entertaining begins with a great libation. 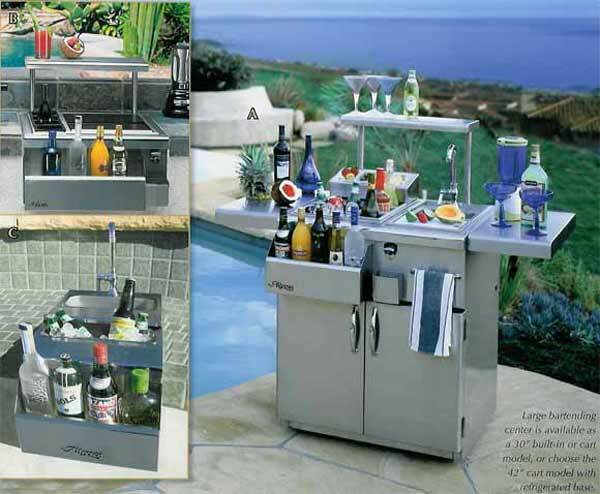 Alfresco's bartending centers let you entertain like a pro with all s/s construction, bottle rails, and insulated ice compartments. A. Large Bartending Center. Available in a 30" built-in cart model, or a 42" refrigerated cart model, our large bartender features a sink with removable cutting board, towel bar, bottle opener and cap catcher. B. Medium Bartending Center. 24" unit has all the features of the large model without the sink or towel bar. C. Small Bartending Center. 14" unit features a sink, insulated ice bin and bottle rail.ll Bartending Center. 14" unit features a sink, insulated ice bin and bottle rail.